My world was rocked for the first time when I was four years old. We had recently moved to Southern California. Early morning sunlight had just begun to peek through the window in the room my sister and I shared upstairs when our beds began to shake. The matching white pom-pom trim on our bedcovers bobbled and bounced against the floor. Feeling nothing but terror, we fumbled downstairs and saw the light fixture over our kitchen table about to swing off its hook! Cupboard doors banged open and shut; coffee cups and dishes spilled out, spreading splintered glass across the hardwood floor. Then, without warning, it stopped. We stood in silence, too stunned and scared to speak. The San Fernando earthquake was the first, and biggest, earthquake I experienced while growing up. For months, aftershocks rattled our world. We learned quickly that earthquakes were simply part of living in California but knowing the plates of the earth could shift at any moment didn’t remove our terror. I can’t forget the wildfires either. Annually, flames devoured manicured landscapes and beautiful homes. I remember the smell of burning brush, sunsets coloured by grey ash, early mornings when my dad and I would wipe white dust off our cars. California forced us to accept nature as it was. We treasured the mild climate, nautical voyages, and adventurous mountains; we endured the earthquakes, wildfires, and nature’s unpredictable, uncontrollable fury. Matthew 13:31–32: Faith the size of a mustard seed can move mountains! Wasn’t someone supposed to tell us this was coming? How do we move forward...we have nothing? The first steps are always the most difficult because EVERYTHING is different. Survivors start out feeling mad, lost, afraid, vulnerable, unstable, and sad. As the process unfolds, sometimes the anger softens. Grief surfaces. Fear subsides. Something incredible begins to happen: people settle in, they find a “new normal,” and they are never the same. Other times, the people never recover. My husband has observed one difference between those who move forward and those who don’t: perspective. Those who succeed “reframe” what’s happened. During the recovery process, they engage their minds (thoughts), hearts (emotions), and daily habits (behaviour) with the goal of changing their perspective. “Reframing” isn’t just for those who’ve survived natural disasters. At some point, it becomes essential for us all. It’s the key to thriving through unexpected diagnoses like cancer or autism...undesired changes like divorce or job loss...unpleasant challenges like defiant teenagers or aging. Abuse, death, paralysis, chronic illness, special needs, financial pitfalls, and disappointments and struggles of every kind—they all demand we reframe or stagnate. Reframing requires us to mentally examine our assumptions, beliefs, and values; to emotionally adjust our attitudes and harness our feelings; and to cultivate new daily habits and routines. It isn’t an easy process. It IS a life-changing process. One couple who lost everything in Hurricane Katrina contacted my husband not long ago. He asked how they were, and their response was amazing! They said they now appreciated the small things in life. They valued their relationships. They had slowed their pace and given time to people rather than things. They had become involved in helping others. They were even able to say they were thankful for the experience of losing everything, because through it, they found meaning and purpose! When disaster strikes or change stirs up our insecurities, most of us long for relief. There’s nothing wrong with that. But Christ calls us to reframe our lives—to embrace the transforming process of dying to ourselves, identifying with Him in our suffering, and becoming more like Him by embracing His ways. I haven’t been through an earthquake in years, but I have hit rock bottom repeatedly. I’ve felt pain so deep I couldn’t speak, loss so grave I didn’t think I could go on, fear so huge there was no light in sight. Through these end-of-the-road experiences, I’ve found Christ, who has been my hope. I’ve gained scriptural insights I would have never noticed before. Through chronic pain, abuse, divorce, and the heartbreak of a failed justice system...as well as the struggles and joys of remarriage, a blended family, and parenting a child with special needs, my character has been refined. Each time Christ brings me to the end of myself, He transforms me further into His image. Transform is another word for reframe. Ten years ago, the Lord opened the doors for me to use my experiences to walk alongside others through Insight for Living’s Special Needs Ministries. When we realized our audience included many people besides those impacted by special needs, we decided to change the name to Reframing Ministries. Our goal is simple: to bring hope, help, and humour to you as you go through life’s daily struggles, grief, disability, unexpected changes, and other experiences that present you with the opportunity to REFRAME. Being transformed into the image of Christ isn’t something that just happens. God works the miracle, but we must participate by aligning our lives with His Word...by allowing His grace to reframe our perspective. It’s hard, painful work! But if you want to live more fully, laugh more deeply, and love more authentically, the only pathway is the process of reframing. I close with advice from the wisest man who ever lived: Here now is my final conclusion: Fear God and obey his commands, for this is everyone’s duty (Ecclesiastes 12:13). 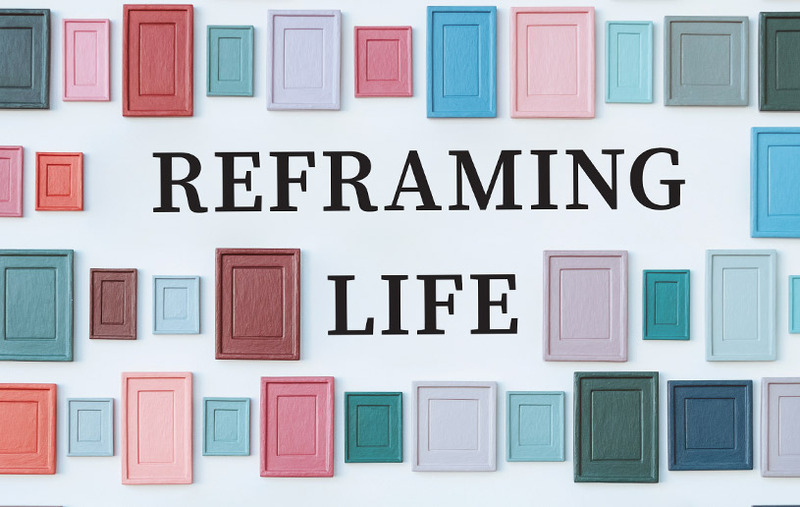 If you’re wondering where God is or feeling stuck, I invite you to come along with me on this journey, on this one-step-at-a-time process I call “reframing.” It isn’t a formula, an “if I do this, God will do that” kind of thing. It’s a mindset...an integration of our humanity and God’s sovereignty. It won’t be easy, but you won’t be alone. And I promise, you will never be the same!